The former UKIP chief and leading Brexiteer rolled into Westhoughton, Bolton in his new battle bus. 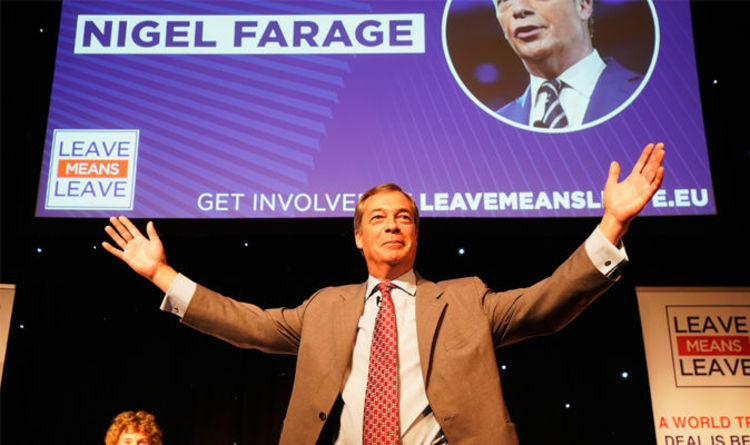 It is ahead of a major rally in the town where he will speak alongside former Brexit secretary David Davis and Labour Brexiteer MP Kate Hoey. The MEP said the Prime Minister Theresa May’s strong message to the EU yesterday following the bitter Salzburg debacle was enough to save her job during the Conservative Party conference next week but that the Chequers deal was “dead”. He claimed the “political class” was planning a “major betrayal” and urged voters to write to their MPs to ensure Brexit is delivered. Mr Farage said: “Every single day there’s a negative story about Brexit and what a catastrophe it is. “This is us coming back with a counter campaign. “I think if there was a second referendum Leave would win by a lot bigger margin. As arrived in his bus, he called out to the public “we have not changed our minds, we want Brexit”. It comes amid calls among MPs for a “people’s vote” on the final Brexit deal, which Brexiteers blast as a second referendum in disguise. The Brexiteer added: “This is not about party politics. This is above party politics, it is above personal ambition. “It is very simple, we want our political class to deliver what was the greatest democratic exercise in the history of this country. Brandishing a “Leave Means Leave” poster he added: “And what this campaign intends to do, you can see very clearly here, here are the names of all the MPs and all their contacts and we want people living in this area to go to their MPs and say unless you deliver the Brexit we voted for we will never vote for you again. “This really is the people versus the politicians. It was during the referendum and it still is today. “This is the establishment, not just the British, the global establishment. The rally later on Saturday at the University of Bolton Stadium, is the first in a number of events across the country organised by Leave Means Leave, the pressure group campaigning for a “clean, swift exit” from the EU. Many Brexiteers have blasted Theresa May’s Chequers proposal as a betrayal of the referendum vote. It includes an end to the free movement of people, a free trade area for goods under a “common rulebook” and a “facilitated customs arrangement” which aims to maintain easy trade in goods between the UK and the EU whilst allowing Britain to develop an independent trade policy with the rest of the world. But Mrs May’s plans were dismissed as damaging to the single market and unworkable by EU leaders at a summit in Salzburg on Thursday.